Developing bad spending habits can affect your financial future. Like any habits, they are hard to break. However, with some careful planning and conscious decision-making, it is possible to change your spending habits. This will improve your financial outlook. Many people who manage to live on their salaries think they’ve got their finances under control. This is not necessarily true. There are ways to use your money more effectively. This will leave you with some extra money at the end of the month to save towards that dream holiday or something else you’d really like. A budget is an essential part of the management of your finances. Write down your income and list your expenses. A lot of people think their expenses are limited to the debts and accounts they pay each month. However, they need to include your living and day-to-day expenses. A detailed budget will give you an accurate picture of how much money you have remaining and avoid unpleasant surprises. If your expenses outweigh your income, you’re living beyond your means. This puts you in a continuous state of debt. Trim your expenses to make sure they fall in line with your earnings. Bad shopping habits lead to bad spending habits. Limit the amount of time you spend in a supermarket. 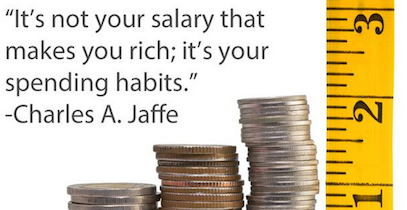 Going daily results in you spending more money than you should. You go in with one item in mind and walk out with 10 items. Monthly grocery shopping is the best way to break this habit. When it comes to milk, bread and fresh fruit and vegetables go shopping once a week. Milk and bread freeze beautifully. Determine a figure to allocate to your budget for monthly shopping and weekly shopping. Stick to it. A lot of people are indebted by accounts and credit cards that they use to buy things they should be using cash for. If you’re using a retail account or credit card to buy your groceries, there’s something wrong in your budget. Opening accounts doesn’t give you free rein to go on a spending spree. These accounts need to be paid off. With credit cards, interest is charged on the debt. Getting buried in credit with overdue accounts and borrowing from Peter to pay Paul will get you into trouble. Avoid using accounts and credit cards. Save up your money and buy the things you need without incurring debt. Taking out loans and using credit cards to buy the things you want instead of the things you need starts a debt cycle. Breaking the cycle is hard. Loans and financing are for buying a home and a car. You should save and pay cash for anything over and above that. Borrowing money to buy a quad bike which is for your entertainment is unwise. Instant gratification might be attractive, but the payment and the interest rate won’t. 1Where a loan is necessary, make sure you have life insurance to cover the debt if you die. If not, you’ll burden your family with your debt. You should be saving at least a portion of your monthly income. It’s never too late to start. Don’t splash out using the extra money you have at the end of the month if you’re not taking care of savings. Part of your savings should be investment in your retirement. Retirement planning is important from the time you start working. When you’re in your 20s, retirement seems a long way ahead, but it isn’t. Don’t rely on your pension to fund your retirement. A comfortable retirement requires additional investment such as a retirement annuity. This investment has the added advantage of giving you a tax refund every year. Education planning is important. Tertiary education is expensive. Work on the assumption your children are not going to get full bursaries. Ask a financial advisor to show you different products that can act as education savings mechanisms. Download a budget app to help you keep track of your money. Shop wisely to save money. Avoid going into any unnecessary debt. Consult a financial advisor to plan for your retirement and your children’s education. Bad spending habits can change.